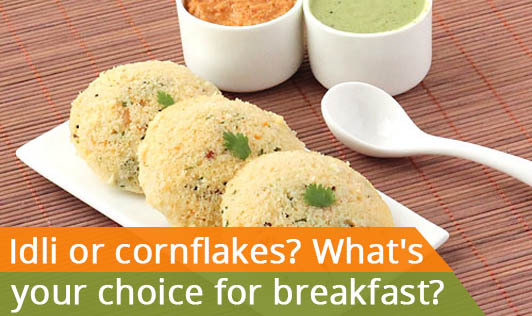 Idli or cornflakes? What's your choice for breakfast? Traditional Indian breakfast options, as the name suggests, are traditional and have been around for many years now. Most of us have grown up eating these for breakfast and haven't experienced the much talked about "childhood obesity". That surely counts for something, right? If these options are really high in calories and unhealthy, we would all have obesity and its related problems much sooner. Another point that you need to remember is, it is not just the calories which matter. There are also nutrients like fiber, proteins, vitamins and minerals which have to be considered. It is true that processed breakfast cereals have all the nutrients in them, but they are added to it and are not naturally found. A traditional breakfast like upma gives you carbs, proteins, fat, vitamins and minerals, all in its natural form. Another thing that you need to consider is that our bodies are used to having traditional breakfast and digests it better than processed cereals. We are also used to having a savory breakfast than a sweet one. The whole idea of having breakfast cereals and bread for breakfast started with westernization. Every body has different needs. Habits, culture, environmental conditions and traditions play a very important role in the dietary habits. We cannot expect the westerners to have idlis for breakfast! In the same way, it is not wise for us to have processed cereals for breakfast every day when we have the wonderful tradition of having freshly cooked, hot and healthy food for breakfast. Processed cereals are not bad for your health but considering the other options that we have, it is better to limit the intake of processed cereals to once or twice a week. Our Indian breakfast is usually balanced and wholesome in terms of nutrition. Most of them are a perfect blend of cereals, pulses and vegetables. Processed cereals come with a load of hidden ingredients that we are not aware of. Preservatives, sugar, gluten etc are certain ingredients in such processed foods that can trigger off health problems. So, try having a healthy, traditional breakfast on most days of the week. Having said that, it's important to strike the right balance. You can't be eating pooris and vadas for your breakfast! Find the right balance between traditional foods and processed food!